3D printers are becoming steadily more capable, but few can match the sheer resolution and flexibility of the Objet Connex printer. 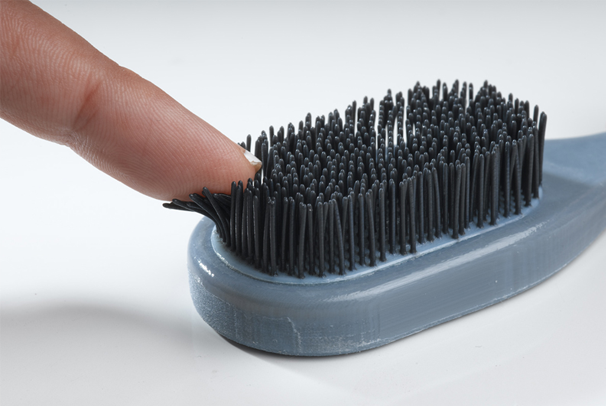 Not only does it print our super-detailed objects, but it can also print using a wide range of colors and materials. Most of the commercially available 3D printers extrude just one material--typically ABS plastic--but the Connex printer can extrude up to 14 in a single print job. The materials can differ in more than hust color, they can be translucent or even flexible and rubbery (as opposed to stiff). This lets you print things with flexible joints, or even something like a translucent rubbery hand over a rigid skeletal bone structure. There are tons of applications for a printer like this, from basic rapid prototyping (something most 3D printers can handle easily) to more advanced, complex prints like skeletal models for medical purposes. The printers are even supposedly easy for anybody to use, so it’s not unrealistic that we could be seeing these in doctor’s offices being used to print out bone models from our x-rays prior to an operation. Objet has a promotional video that shows off a bit of the printer’s capabilities on its website. The company doesn't list pricing for the Connex printer, but it's probably safe to assume that it's considerably more expensive than a hobbyist-grade 3D printer. I know I’d be happy with a Printrbot or a RepRap.